Each year the OAS Secretary General publishes a proposed Program-Budget for the coming calendar year. The OAS General Assembly meets in a Special Session to approve the Program-Budget. Find these documents from 1998-2013 here. Each year in April, the OAS Board of External Auditors publishes a report covering the previous calendar year’s financial results. Reports covering 1996-2016 may be found here. Approximately six weeks after the end of each semester, the OAS publishes a Semiannual Management and Performance Report, which since 2013 includes reporting on programmatic results. The full texts may be found here. Here you will find data on the Human Resources of the OAS, including its organizational structure, each organizational unit’s staffing, vacant posts, and performance contracts. The OAS executes a variety of projects funded by donors. Evaluation reports are commissioned by donors. Reports of these evaluations may be found here. The Inspector General provides the Secretary General with reports on the audits, investigations, and inspections conducted. These reports are made available to the Permanent Council. More information may be found here. The OAS has discussed for several years the real estate issue, the funding required for maintenance and repairs, as well as the deferred maintenance of its historic buildings. The General Secretariat has provided a series of options for funding it. The most recent document, reflecting the current status of the Strategy, is CP/CAAP-3211/13 rev. 4. Here you will find information related to the GS/OAS Procurement Operations, including a list of procurement notices for formal bids, links to the performance contract and travel control measure reports, the applicable procurement rules and regulations, and the training and qualifications of its staff. The OAS Treasurer certifies the financial statements of all funds managed or administered by the GS/OAS. Here you will find the latest general purpose financial reports for the main OAS funds, as well as OAS Quarterly Financial Reports (QFRs). Every year the GS/OAS publishes the annual operating plans for all areas of the Organization, used to aid in the formulation of the annual budget and as a way to provide follow-up on institutional mandates. Here you will find information related to the OAS Strategic Plan 2016-2020, including its design, preparation and approval. 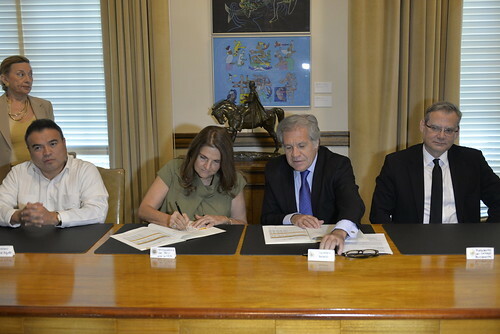 The Organization of American States (OAS) and the Government of Peru today signed at the headquarters of the hemispheric institution in Washington DC the agreement on preparations for the Eighth Summit of the Americas, the meeting that will bring together all heads of state and government of the Hemisphere in April 2018, in Lima. OAS Secretary General Luis Almagro reiterated the commitment of the Organization to the principles of cooperation promoted by the hemispheric event and highlighted the relevance of the theme chosen by Peru, as well as the importance of continuing to strengthen the participation of civil society and other social actors within the framework of the Summit. "The theme of 'Democratic Governance against Corruption´, chosen by the Government of Peru for the next Summit, is part of the essential mandates and tasks of the OAS. We will be working together during the Summit to contribute to agreeing on tangible actions and results that help our region to face the challenges of governance and corruption,” said Secretary Almagro. For her part, the Representative of Peru to the OAS, Ana Rosa Valdivieso, appreciated the support that the OAS gives in the organization of the Summit and the relevance of the theme chosen by her country. "We have begun the process of preparations for the Summit, we believe that the theme that has been chosen is a current topic of great importance for the region and we will put all our efforts in making the Summit successful, this means, that it achieves concrete results and policies that make sense for the entire region,” she said.